Photo courtesy of Michele Garramone. I always wondered what she was reading. Jane Austen is the character from the secret Amazonian village on the other side of the island. Which one of those 2 ladies is Robinson Crusoe? The other would have to be Friday. Turns out Friday was a zombie. Romantic fiction similar to Brokeback Mountain. It is a truth universally acknowledged, that a single man in possession of a good island, must be in want of a native named Friday. I can’t wait for the Charlotte Bronte version of Dracula. Maybe this is a book about someone reading another book. Bookception! On top of that . . . There is no charm equal to tenderness of heart, except hunting wild goats with a sharpened stick. Robinson changed his last name to Curseyou after meeting Jane. Did he get all his ladies done by Friday too? @jjhitt. Just as with a good woman, wild goats may also be eaten raw. Frankly ma dear, I don’t give a damn. 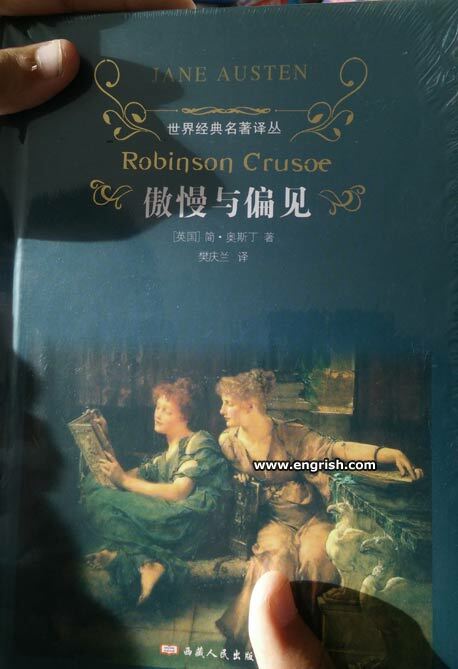 It is neither Robinson Crusoe, nor Pride and Prejudice. It is that book about the famous football coach – Warren Pearce. Maybe the book SHE’S reading is “Robinson Crusoe”? Joe Friday gets a cameo role. One lady is Friday. The other is April. SO! If I did Friday on Tuesday, could I do April in March? And I gladly would do so do so do so do so do so do so do so do so do so. I think they meant Gilligan’s Island. Crossovers aren’t just for comic books anymore.